My name is Cameron, and I am the Game Designer at Virtuix. I have been working at Virtuix since August 2014, and it has been a blast getting to see how much the VR industry has developed during the past year. I joined Virtuix immediately after graduating from Texas A&M University with a BS in Visualization. Growing up, I always had a passion for video games, but it took me a while to realize that I could make a career out of what I was passionate about. When I started attending Texas A&M, I was actually a business major, and it wasn’t until my sophomore year that I figured out that business was not the right major for me, and that I should pursue what I was passionate about. After switching majors, I furiously began to learn everything I could about making games, taking full schedules each semester and summer. I was also able to spend a semester of my education in Scotland, at Abertay University, which has a great game development program, and helped me refine my knowledge of game design. For those of you who might be interested in becoming a game developer, download Unity or UE4 (they are free), and start making games. They are great tools to learn on, and they both have awesome communities with tutorials that will teach you just about anything to do with developing games. I still remember what first got me interested in Virtual Reality. When I was about 10 years old, I went to Disney World with my family. The first day we were there, we spent some time in Downtown Disney, and went to Disney Quest, which is similar to an arcade, but with more immersive experiences. One of these experiences was a Pirates of the Caribbean game that was in a surround-screen room that was shaped like a ship. To play the game, we were running around to little cannons and pulling a rope to shoot other ships on the screen. It was an awesome experience as a kid, and since I was a console gamer, it made me think about how to bring that sort of immersion to a more accessible space. Little did I know, that 13 years later, I would be working on a product that is making that immersion possible. When I joined the company, the Omni was only capable of forward movement, and it was only one speed. Since then, we have added functionality for analog speed, strafing, backwards movement, decoupled walking, and recently decoupled aiming with the Vive. This has given us the opportunity to do much more within our game demos, including several maneuvers in Training Ops. The more freedom of movement that is given to the player in the game world, the more immersive the experience is, and it will only get better from here. Travr: Training Ops is a First Person Shooter training course that challenges players to be both fast on the Omni, and accurate with aim. The game will consist of several levels, each made up of about 5 rounds each. Each of these rounds will take anywhere from 15 seconds to 2 minutes, and will challenge the player in a specific skill. This round tests accuracy and speed. 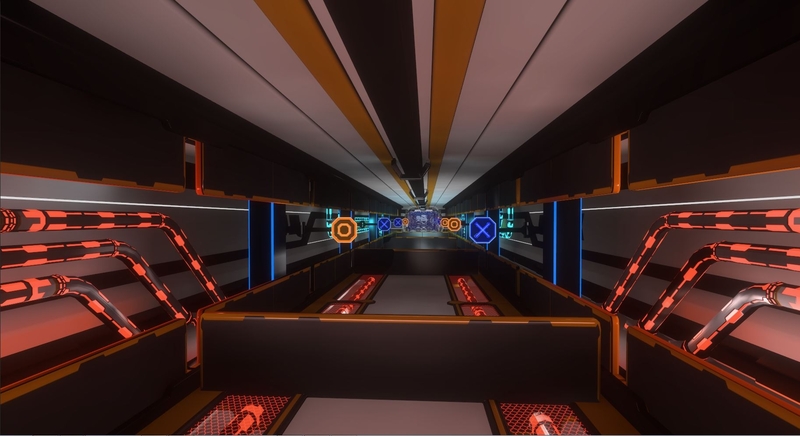 The idea behind the round is that if you are accurate enough with your aim, and quick enough with your decision making, then you will never be stopped by the barriers and you will be able to sprint straight through the round. However if you fail to hit the targets quickly, then you will have to stop at the barriers which will affect your time bonus. Run Time - This is the actual time that it takes the player to run through a round from the start portal to the finish portal. There will be 5 scoring tiers based on the run time. If you are able to attain 5 stars on a round, then you receive the maximum number of time-based points for that round. Targets Hit - Every time the player hits a target, they will earn points towards their score. There are 4 different target types: Easy, Medium, Hard, and Negative. 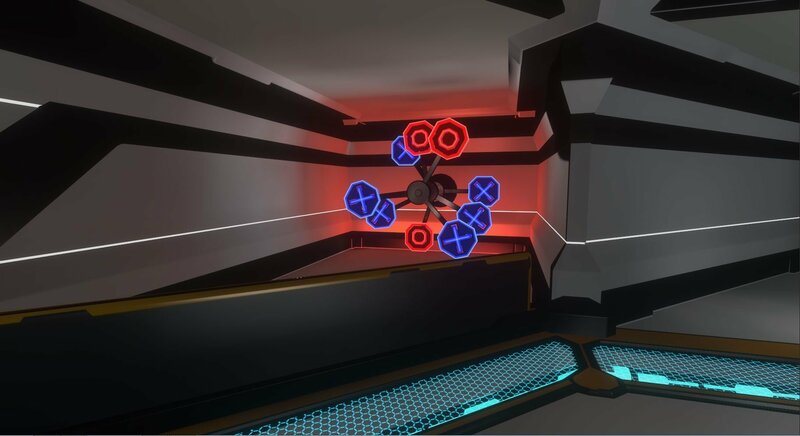 The player will receive different point values depending on the type of target hit. Accuracy - The player will be receive additional points for shooting consecutive targets without missing. It will take time to master any one of these factors for each level, but it will be true feat to master all of them in a single run, which is what you will have to do to top our leaderboards. 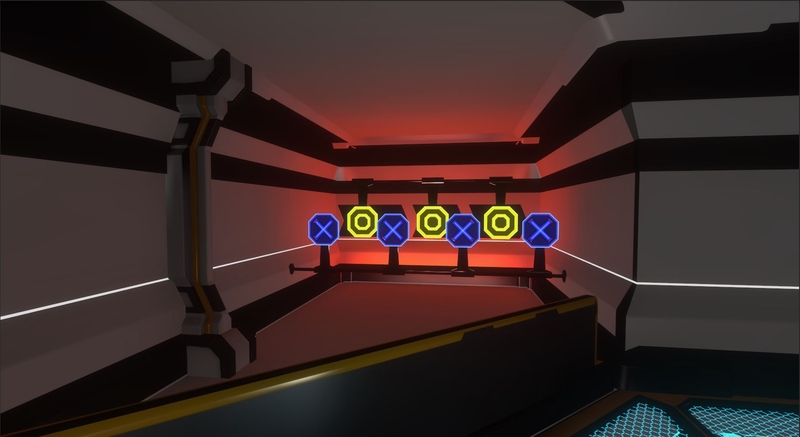 The targets throughout the levels have various behaviors to increase and decrease the challenge of shooting specific targets. These are some of the target behaviors that are currently in the game. 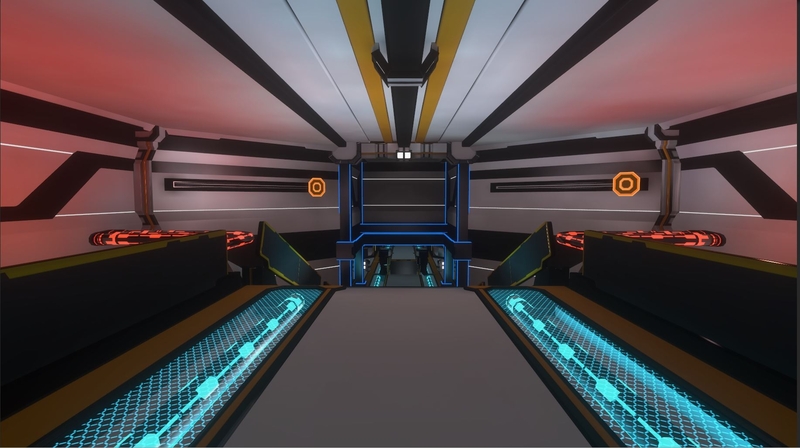 The first image shows targets on a track that move back and forth. The second image has stationary targets, but they are very close to some negative (blue) targets. These are both pretty easy obstacles, and they don’t hinder the player’s progress through the level very much. The third image has 3 rotating fans stacked on top of each other, and the middle fan is rotating in the opposite direction. This is a very difficult obstacle that challenges the player’s accuracy. If you are careless, then you can lose a lot of points on this obstacle by shooting all of the negative targets. If you are patient and accurate, then you can progress past this obstacle fairly quickly. @Omni_Dev_Cameron I noticed that you didn't have the guns connected to the body of the character. I think I've seen that technique used pretty much everywhere. I was going to add duals swords and maybe some mobs to my demo here: http://forum.virtuix.com/discussion/2555/creating-a-tutorial-for-cryengine-unreal-world-machine#latest I looked at some animations, for example here: www.youtube.com/watch?v=FxFTHZ_u0Ik And while that looks cool, I can imagine it's probably near impossible to do while just reflecting the pos, rot of the touch controllers to the swords is probably trivial (or at least I assume it is) without worrying about the avatar. That being said, have you seen anyone attempt to connect the character to their items with either vive/oculus? Even guitar hero, Oculus's flagship, doesn't seem to connect the instrument to the avatar. Also, I really like the idea of hand props + omni. This I think will be a huge advantage of the Omni over non Omni games. If you have your hands busy disconnected from your body doing important things (shooting / slashing / boxing) you can't very well expect the player to be using them for controlling locomotion at the same time. Hmm, that being said... Multiplayer Boxing might be a killer app for the Omni / Touch controllers, do you think? Connect that body to your touch controllers so you don't have disconnected controllers / body and you're off to races. @blazespinnaker If I am understanding you correctly, you are referring to Inverse Kinematics to get the arm and hand to still look proper while the hand is following the touch controllers. There is a reason why most people try to avoid this. It is a difficult thing to accomplish and make look good, and It is easy to get away with floating hands. I have seen it attempted, and I expect that we will see it more and more as the systems become easier and easier to work with. Thx for the terminology. I imagine a problem with this also is that it doesn't line up with your RL body which could cause weirdness. If there were something that could scan your arms and make sure they're reflected properly in VR than it'd be better.